Luciano Kulczewski was not just a pioneer of modern architecture in Chile; he was also a humanistic soul with a deep commitment to the Chilean working class, a connection so strong that he was one of the founders of the country's socialist party. “Kulczewski believed in reincarnation. He thought he had been a dog in his previous life, like those stray dogs, wandering round every corner, every tree; and it was true: Luciano was the kind of person who talked with everybody in the neighbourhood, asking about needs and happiness, with kindness and humour”. 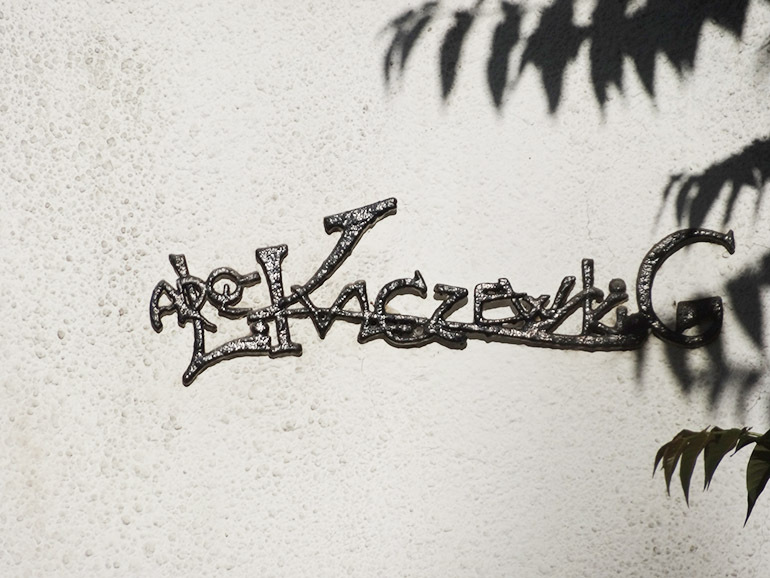 The Polish origins of Luciano Kulczewski date back to the dawn of the 19th century. His grandfather, Antoni Kulczewski, was born on 6th January, 1806, in Jeziorka, Poland. Antoni fought in the November Uprising (1830-31), for which he received the Order Virtuti Militari medal, the highest Polish military distinction, given for heroism in combat. After the war, Antoni was exiled to France, where, after studying engineering, he joined the French Foreign Legion, and took part in the ‘peace process’ in Algeria. During his stay in Northern Africa, Luciano's father was born. Bolesław Kulczewski, a civil engineer specialising in mining, would move to Chile in 1872 to work in the country's growing mining industry. Lota is a small town in the south of Chile, considered to be the ‘Capital of Coal’. There he met a socialite from Concepción, Luisa García Rodríguez, with whom he was to have two children. One of them was born on 8th January, 1896. His name: Luciano Kulczewski. Luciano was born in Temuco, Araucania region, an area which was Mapuche (natives of South America) territory until 1880. He studied in the most important Chilean school, Instituto Nacional, under Don Pedro Aguirre Cerda, who would be President of Chile in 1938. 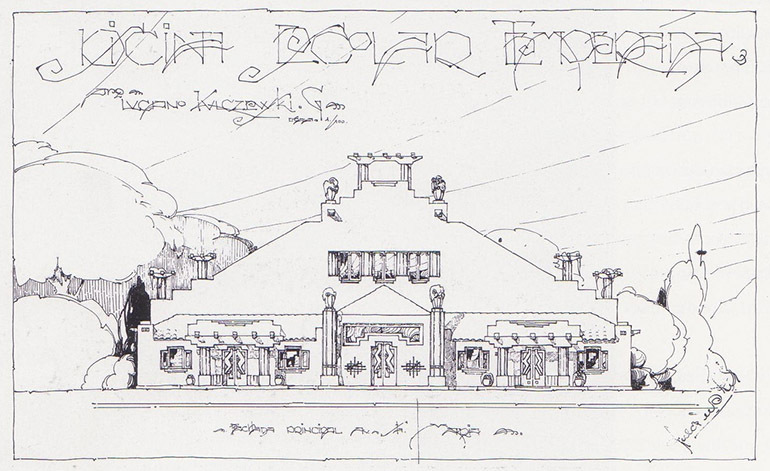 From a young age Kulczewski showed an interest in designing houses, and motivated by his brother, Raúl, he went to study at the Faculty of Architecture of the Universidad de Chile in 1913. A brilliant student with an amazing memory, he was awarded three honorary medals from the Museum of Fine Arts of Chile for his academic virtues. He graduated in 1919 and started to work on his masterpieces. Luciano Kulczewski was always very concerned with human happiness. He believed that architecture must serve to increase quality of life and social recreation. That’s why one of his first works, the Funicular Railway Station in San Cristobal Hill (Santiago, 1924) meant a lot to him, because it gave him great pleasure to see hundreds of men, women and children enjoying its park and public spaces. Kulczewski never understood how ‘architects’ who did not respect nature could exist. He believed in polis, in these ancient Greek city-states, in a small city; in a city where the people can relate each other permanently. He never believed in this huge monster called metropolis, because he considered it was a waste of time and life, the strong effort to travel from the suburbs to their workplaces. Luciano Kulczewski also had a special interest in mankind from a philosophical perspective. He considered a refuge the most important thing for a human being, so housing was his leitmotif, because it’s the only place where each man can find himself. Kulczewski believed that nature had an immeasurable power from which humans must be protected. That’s why he preferred to design more enclosed than open spaces. Every house should be a unique gathering space, totally different for each person, for each family, and it was the main reason why he never approved of the mass production of standardized houses, and was thus very critical of capitalism. Chile's centenary of independence was celebrated from 1910 to 1920, so several public buildings were built, predominately in the neo-classical style of the 18th century. Luciano Kulczewski instead developed a particular style, linking eclecticism, neo-Gothic and art-nouveau, which over the years became rationalist and modern, being a pioneer of these styles in Chile. His early works have been declared National Historical Heritage by the Republic of Chile: National Headquarters of College of Architects (1922) and Funicular Railway Station (1924). 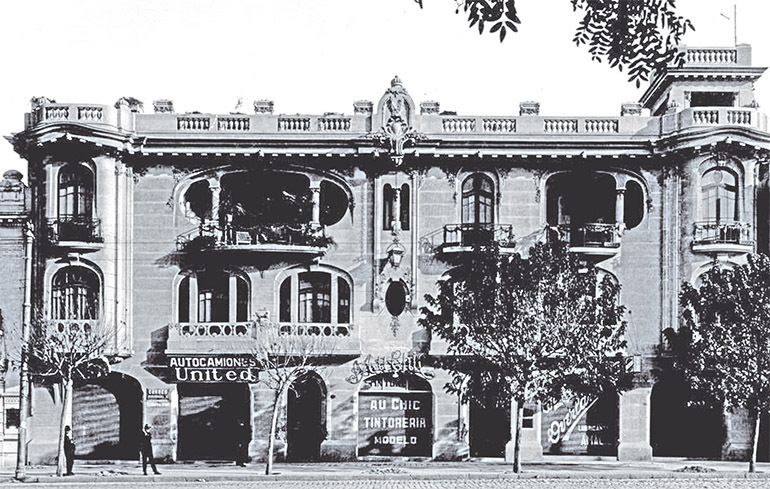 Between 1927 and 1930 he built his most popular buildings, all located in the Lastarria district of Santiago de Chile. The Tenement in 84 Merced St., known as the Art-Deco Building, has an intriguing viewpoint and a mythological animal guarding it. This tenement is inspired by Spanish neo-baroque and it is expressively cubist. The Tenement in 268 Merced St, has a relief of plant designs, similar to the works of the North American architect Louis Sullivan. His private house was La Casa de Los Torreones built in 1930, which mixes medieval, neo-gothic and art-nouveau styles on a triangular plot. This last one is considered a building for historical preservation. My grandfather always said that the human being was born to be happy, and that’s why he believed that the purchase of a house was the most important investment in the life of every man. However, he understood that just buying it didn’t solve the concept of ‘quality of life’. Everything is connected, and this process starts with very good education and academic training, because it makes people autonomous, and they can better decide their own futures. They can also have access to better jobs and can overcome poverty. My grandfather always believed that education came first, and that it was the responsibility of the State. - said Jaime Larraín Kulczewski, architect and grandson of Luciano Kulczewski. 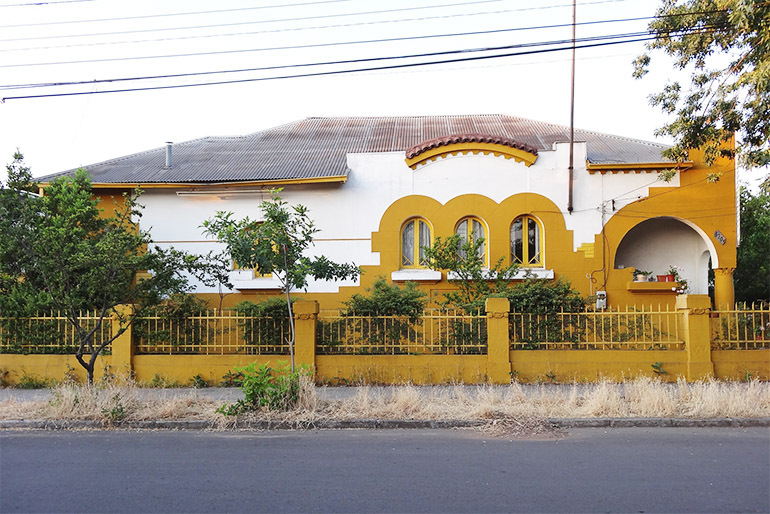 In the 30s, the already popular Luciano Kulczewski began to devote his efforts to building single-family houses for workers in different parts of Santiago, like Población Madrid. His strong criticism of mercantilism made him avoid the practice of his profession, leading to a political commitment to Chilean society. So, in an attempt to extend his humanistic roots, and along with another architect, Arturo Bianchi, he founded the Socialist Order in 1931. It turned out to be one of the political branches that ended up forming the Socialist Party in Chile (currently in power). In 1933, Kulczewski designed the official logo of the party, which is still used today. In 1937, Kulczewski participated in the presidential campaign of the leftist Pedro Aguirre Cerda, who was his language teacher at secondary school. Similarly, Kulczewski became the campaign manager of Aguirre Cerda, who was finally President of Chile in 1938. The next year, Kulczewski was appointed Director of the Workers Social Security Office (Caja del Seguro Obrero). His purpose was to change the perspective of the health system from the concept of ‘curing disease’ to ‘preserving life’, changing the health plans of Chilean workers. During this odyssey, he worked closely with Salvador Allende, President of Chile (1970-73), who died in the coup d’etat organised by a general of the Chilean Army, Augusto Pinochet, who became dictator of the country for 17 years. Kulczewski, when in office, had the responsibility of leading during one of the most devastating earthquakes in history, the 1939 Chillán earthquake, which reached 8.3 on the Richter scale and left more than 30 thousand people dead. As a skilled urban planner, Kulczewski was in charge of reconstruction and aid for the victims who had lost their homes. Before 1941, he also built a number of housing projects for workers in the arid Chilean desert. This work meant a revolution in modern housing in Chile, and marked the first rationalist steps of Luciano Kulczewski. After this period, Kulczewski lived with his wife, Lucía Yánquez, in his Casa de Los Torreones until 20th September 1972, when he died at the age of 76. His ages were scattered on the San Cristobal Hill in Santiago, and the Pere-Lachaise Cemetery, in Paris, France. Today the works of Luciano Kulczewski are iconic and represent one of the greatest expressions of art-nouveau and eclecticism in Chile. Each building has unique details printed by him, including gargoyles, iron cobwebs, complicated locks, and some fine Gaudí-esque details. Different private foundations and city halls in Santiago organise tours of the works of Kulczewski, who has become more popular with tourists and the increasingly cultural bohemia of the Lastarria District in recent years.